The Hitching Post specializes in small, short, intimate, and private weddings for couples who desire a traditional Christian wedding ceremony. We believe that every wedding is special and realize how important this day is to those who walk through our doors. Is this the person you want to be married to for the rest of your life? We hope the answer is a resounding “Yes!”, and we can be part of the beginning of your lifetime of happiness together. But, if you decide that you’re not quite ready to wed, yet, we encourage you to take some extra time to think about it. We encourage you to plan your lives together, not just the wedding ceremony and reception. Marriage goes on long after the celebration. What do I need to do before I get married? What do couples typically wear to be wed at the Hitching Post? Can I have a bridal party in my wedding? "We will always hold The Hitching Post in our hearts and have such a wonderful memory of our big day. Thanks for making it such a great place!!" "VERY accommodating! Had everything I needed and wanted. They took GREAT pictures for us. I highly recommend this place!!!" "Great place. Very small chapel to be married in. Easy to schedule, well priced. Very friendly staff and a good reception process. Nice variety of options as well. The Minister is a very smooth speaker, very talented and excellent at setting the mood. Honestly interesting to see I'm action, he's really very good." "Cute,simple, amazing people in the office." "My husband and I loved getting married here. 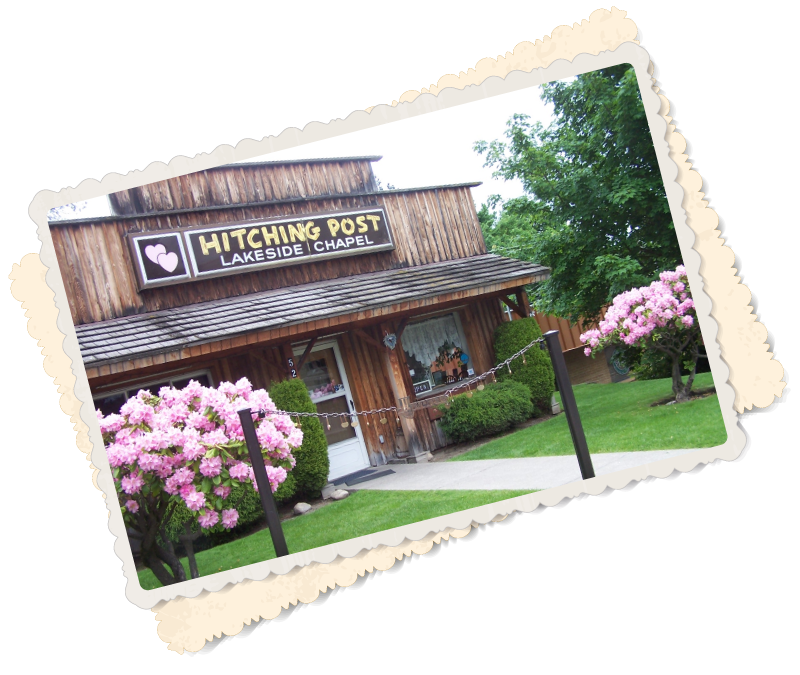 The Hitching Post is small enough that we were not overwhelmed during our ceremony and we could have an intimate occasion with our closest family and friends. Our ceremony felt very personal and not at all rushed or generic. I would get married here again in a heartbeat!" "Thank you so very much for a meaningful wedding ceremony! I would highly recommend your services to anyone who is looking for a small wedding venue." "Very friendly atmosphere making your special moment a pleasant experience.. Christian oriented, definitely the presence of God here..They made our experience one to put in the memory book." "Quaint little chapel if you're looking to get hitched on a budget"
"We were married here in July 2000, great memories and the minister is a sweet Christian woman who took our vows seriously. As we celebrate 16 years of marriage we say thank you for a special day!" "Was married here in February!!! Thank you for being in this town for so many years!!!! Lots of friends and family have used this place! Great people!" "I got married here in August 2012 as many others did, beautiful chapel!"